See the new desk areas with the most saves to ideabooks. Is there a detail here you can use? There are so many reasons to carve out a dedicated home workspace: paying bills, writing letters, answering email and, in some cases, doing your day job. But there’s no reason that churning through tasks at home has to feel like a day in the corporate office. 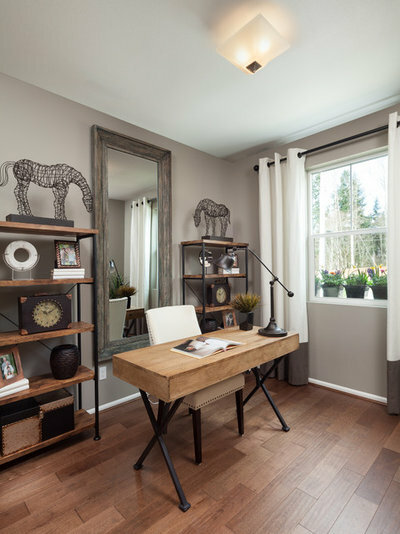 You may as well enjoy a home office that feels, well, a little more homey. 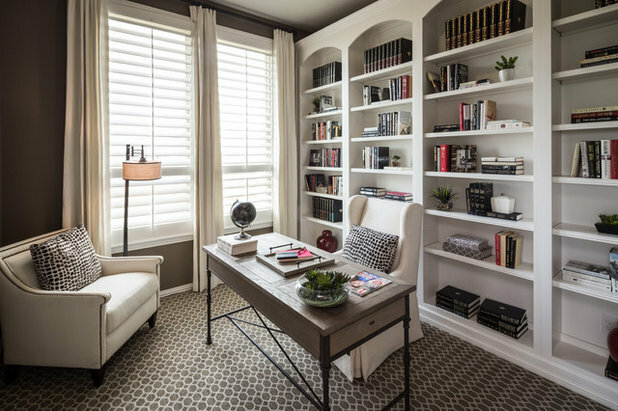 Houzzers have identified these 15 spaces as their favorite home offices, measured by the number of people saving the rooms to their Houzz ideabooks from April through June this year. Which one makes you want to work from home? 1. 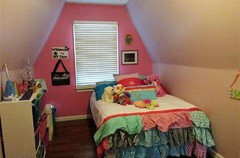 Heart of the home. 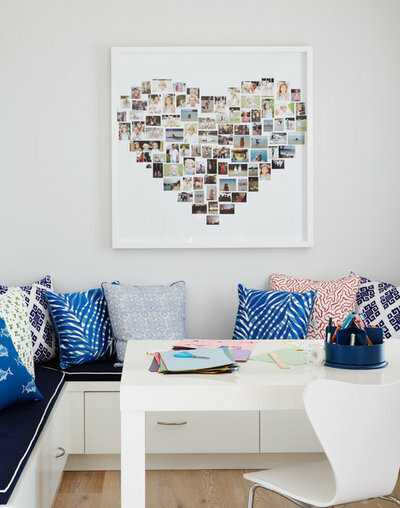 This home office space inside a beach property welcomes the whole family, thanks to a banquette of colorful pillows and a custom piece of art composed of family photos. Adults may not get quite as much work done when the little ones are around, but there are times when that’s the best outcome anyway. 2. For grown-ups only. This office space, part of the same home as the previous photo, is designed for a group. 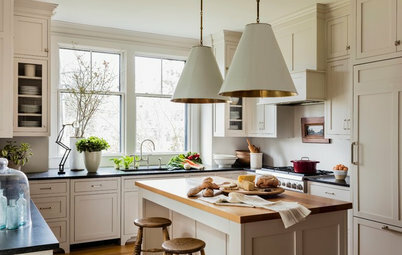 Industrious grown-ups can work quietly away here — or entertain clients — without interruption. The wallpaper, rug, desk and chairs form a neutral base, enlivened by a bright built-in storage unit beneath a colorful piece of art. 3. Eclectic and bold. This room enjoys a similar palette: a neutral foundation of white walls, pale rug, sleek wooden desk and hickory floor, combined with bright bits of color that energize but don’t overwhelm. 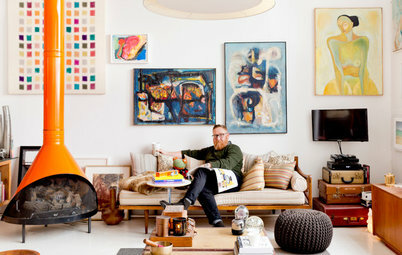 The trio of art on the back wall — actually three pale maps — pulls in the orange and teal scattered about the room. 4. Restrained and clean. This home office feels light and clean, thanks to heavy doses of white. The simple palette of blue and white creates a study-ready atmosphere, while natural materials lend warmth. 5. New Orleans glamour. 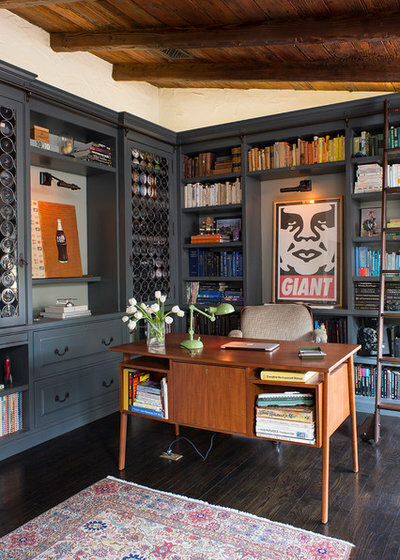 This home office encompasses an entire study inside a Seattle-area home built for a Louisiana owner. 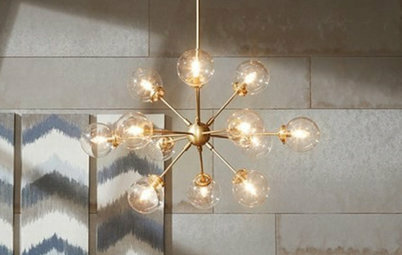 The designer selected finishes that would feel elegant and strong, from the deep blue built-in shelving to the brick fireplace wall. The sturdy desk features a stainless steel top, iron supports and reclaimed wood. At right, cowhide covers the bench. 6. A vibrant palette. In this apartment, complementary colors — blue and orange, red and green — coexist in close proximity, balanced and grounded by an ample supply of neutrals. 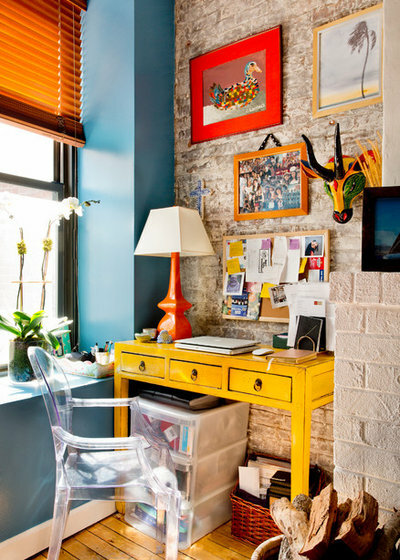 This home office niche offers plenty of natural light in the daytime, while the yellow desk and orange lamp and picture frames warm up the space after night falls. 7. Traditional plus fun. A limited color palette and traditional furniture for this Texas home office blend to create a formal, classic atmosphere for this room. The unexpected, painterly dot print of the throw pillows adds energy. 8. Rich wood. 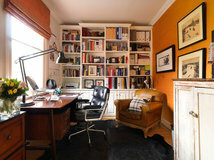 The limited palette of this traditional-style home office gives the room a feeling of stately calm. The wall paint complements the deep tone of the wooden shelving unit and desk, while grass cloth in the media unit opening adds texture. 9. Restful monochrome. Here, gray-brown wall paint pulls together the various shades of wood in the floor, shelving units, desk and wall mirror. White in the curtains, chair, accent pieces and ceiling provides contrast. 10. Barely-there Scandinavian. 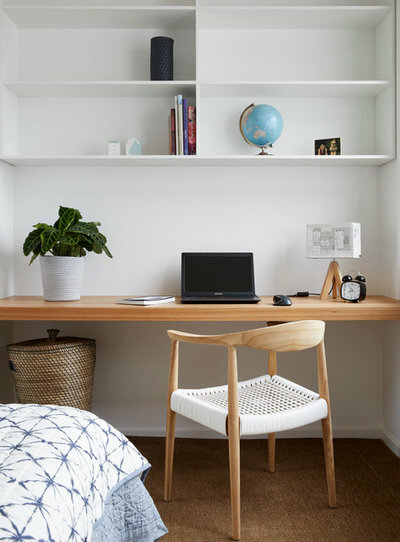 This home office features blond wood, tan carpeting, a white desktop with minimalist lines and a cream-and-tan wallpaper that livens up the space. A black shelving unit and see-through aqua wire baskets create more interest. 11. Bohemian cork. 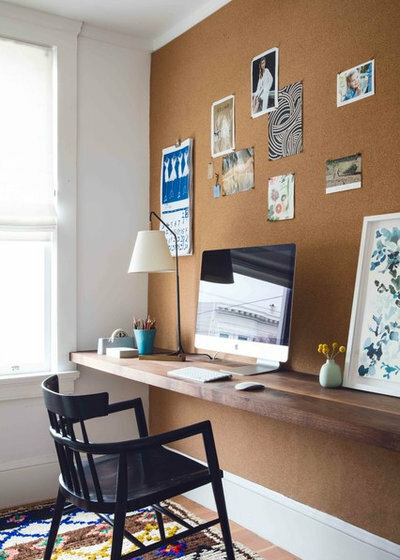 A built-in reclaimed wood desk, bohemian-style rug and simple dark-toned chair marry with a cork wall that brings in a hint of raw sienna, creating a calm, unfussy place to work. Blue artwork balances the warmer colors that dominate the space. 12. Magnetic plaster. 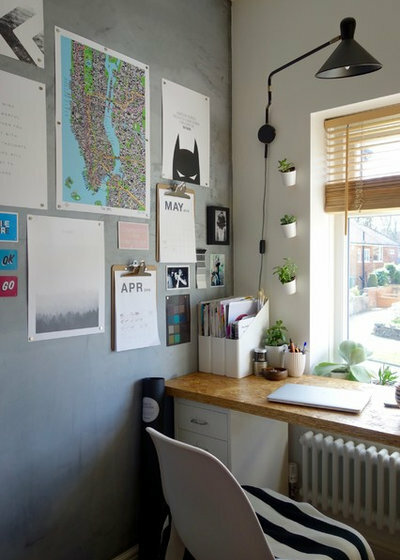 The cool gray tones of this home office wall have an added benefit: They’re magnetic! The desk features a top made of oriented strand board. 13. Beams prevail. Exposed wooden beams create drama in this tailored home office, featuring wall paint that is technically gray but reads as a blue. Warm leather balances the cool wall color. 14. Spanish bungalow. The wooden ceiling evokes old-world character, while built-ins in a gray shade of blue bring modernity to this home office inside a modernized Spanish bungalow in Los Angeles. A floor outlet eliminates a potential trip hazard since the lamp can be plugged in directly beneath the desk. 15. Wooded green. 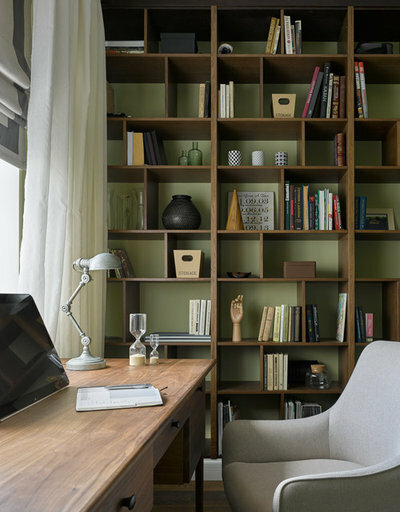 We’re seeing more green in kitchens these days; here, in the last trending desk space on Houzz, the color sets the backdrop for a quiet home office. This home office is actually just a niche in a living room. It’s easy to imagine concentrating here, near a window and in a room where the green-and-wood palette echoes the colors of the outdoors. Just saw this article and comments and wanted to point out that our office space shown in #8 is fully functional as a full time home office and has a printer on pull out shelf behind cabinet doors and a CPU and other ugly equipment on pull out and behind doors on the other side (we didn't show the monitor in the photos but it simply sits on the desk adjacent to a laptop). Our awesome designer who posted this photo worked with us carefully and attentively to design a very functional and beautifully serene office that works beautifully and is gorgeous enough to be a feature room that opens up to our main living space. It's all about designing something that works just for you! Thanks for clarifying. I think your office is one of the rare ones featured in this post that can be labeled as an office with the full functionality of an office. That said, showing pictures that are staged by certain items being removed does give a different impression about the usability and reality of said rooms. 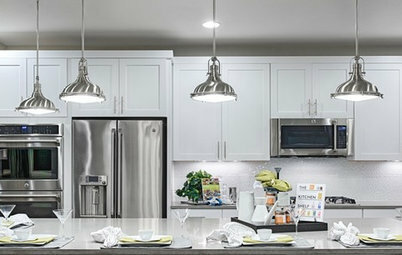 And I am not talking about cleaning up before a photograph is taken, but core items being removed that are used for everyday living and often necessary for functionality. 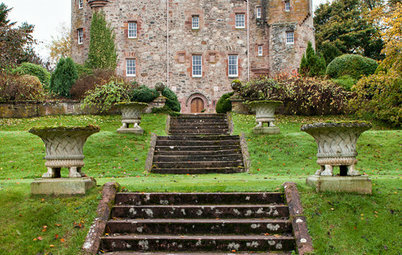 I do think that a lot of Houzzers love to see those beautiful rooms, I on the other hand I would prefer to see how those rooms are used and lived in by their owners vs the staged set for the photograph. Anyways, it is a a very nice office and I love that you hid all the accessories.